A two-story brick store was erected at the northeast corner of the Amherst Common at Main Street, for Samuel Fowler Dickinson, in the summer of 1825. Although not as grand as David Mack's 1838-1839 Phoenix Hall, this building has been pictorially represented from its earliest form through its 1868 move and its reconstruction following the two March 13th fires in 1876 and 1888, to its present 21st century form. It is curious that in the various historical accounts of Amherst's commercial buildings this one has remained unnoticed, although it may be the oldest surviving brick store in the center of town. 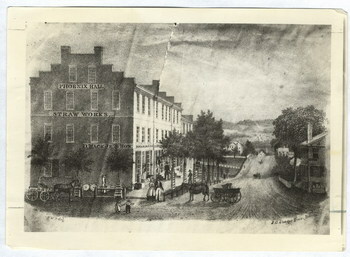 Detail of lithograph of Main Street, 1840. 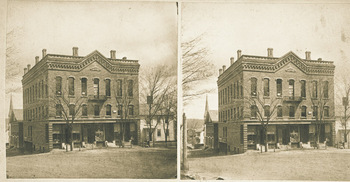 Original Union Block building is visible on the right (now site of Town Hall). Valued at $1800 in 1826, at first it housed Graves and Fields general store on the ground floor, with offices above, including Edward Dickinson's attorney's office. Briefly Fields & Dickinson's store, by 1829 it had passed into the hands of John Leland and Nathan Dickinson (Samuel Fowler Dickinson's nephew). The latter bought out Leland and took on Solomon Pitkin as partner by 1831, and a series of general store partnerships ensued to the 1860s. Detail of Main Street, circa 1860. Original Union Block building is visible on the right (now site of Town Hall). Apparently Pitkin ran the store for the most part for several years, with stock in trade valued at $5,000 to $6,000; William Kellogg Jr. became an active partner by 1836. While continuing to own half the store, Nathan Dickinson moved to Michigan by 1841 and sold his half of the store to Kellogg in 1843, by which time Kellogg & another partner ran the business; Pitkin moved away by 1846, and his widow sold his half of the store to Kellogg in 1852. It became Kellogg & Allen's store, valued at $2750 in 1854, with $6,000 in stock. The following year the building was leased to M. Adams Allen & D.W. Palmer for seven years, at $308 rent per year; the lease was reassigned to M.A. & B.W. Allen for the residue of the term in 1859, but Dwight W. Palmer bought the property from Kellogg at that time, for $3800. He then had another store in Phoenix Row, but moved to his own building early in 1862. Palmer Block between the 1868 and 1876 fires. Old Union Block with a gabled roof is visible on the left. By then the building was called the Union block. Advertisements in the newspapers from 1844 on show a dentist, Dr. Chester Stratton upstairs and a watch & silverware dealer, S. Harrington at “#2 Union block”. Edward Dickinson was not advertising, so it has not been ascertained that he maintained his office there, although he did leave and return to it in 1868 while the building was in transit. It was Dwight W. Palmer who decided to build a larger store and move the old building. On Mar. 12, 1868 the Hampshire Express notes: “Mr. 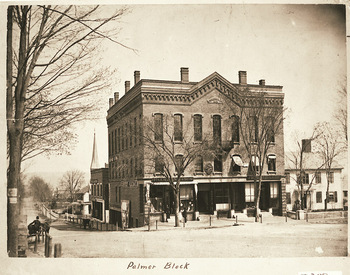 D.W. Palmer... to erect a large building on the site where his store now stands... brick, three story... the present building is to be moved east.” By mid-June the old block had been relocated to its present location and turned 90 degrees to face Main Street. Upon completion of Palmer's Block, Edward and Austin Dickinson moved into the new building. 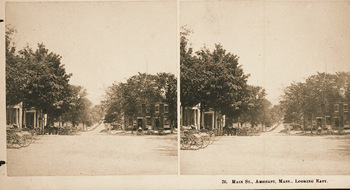 Palmer Block and Main Street between the 1876 and 1888 fires. Old Union Block now has a flat roof. 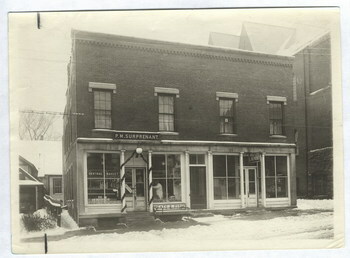 Various businesses occupied the Union block briefly after its move; but Sumner O. Polley's tobacco shop and “temperance saloon” remained many years. At the time of the March 13, 1876 fire (amply reported in the Amherst Record, 3/15/1876) in addition to Polley's saloon were a department of Palmer's dry goods business, Charles King's barbershop, Mayhew Merritt's gold pen manufactory, Smith & Henry's meat storage, A.B. Culver, and a room for the Grand Army and Amherst Grange. By July S.O. Polley was back, as were Smith & Henry and Palmer & Bangs, and the office, press and bindery of H.M. McCloud, publisher of the Amherst Record were in place. Merritt returned later, and by 1886 T.R. Hill's Restaurant shared the first floor with Polley, the Amherst Record having moved to larger quarters. 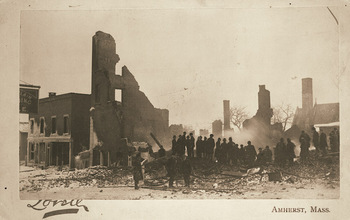 Ruins of Palmer Block after the fire of Mar. 13, 1888. Union Block is visible on the left. Another March 13th fire in 1888 destroyed Palmers Block, the Cooper house just to the south and much of Union Block. The Amherst Record reported that the walls of the latter “are in fairly good preservation and may be reused in rebuilding.” D.W.Palmer had the building fixed up and S.O. Polley returned, joined by John Mullen's Meat & Provisions market. The larger Palmer's Block was not rebuilt, but the property (and the adjacent Cooper lot) were sold to the Inhabitants of the Town of Amherst for a Town Hall, which is still in place. Polley's saloon remained for the rest of the century, and other meat markets followed Mullen's, he having moved to other quarters. From 1903 to 1906 Ideal Lunch & Pool Room was in the building. Judges Block on Main Street, circa 1923. The window pattern on the east side of the building remains as shown on the 1840 lithograph. In 1910 Palmer's heirs sold the building to Abbie Shumway; within the year it was bought by John M. Judge, whose tobacco shop succeeded Polley's. American Express had their office there for a while. By 1915, Peter Surprenant had his meat market, later called Central Market, on the west side of the “Judge Block”, while caterer Albert Bias located mid-building. By 1919 Sing Lee's laundry occupied the east side, as photographed for the newspaper. In 1923 Judge's heirs sold to Surprenant for $12,000, and he in turn to Lucinda C. Barrett and her son, Dr. Charles G. Barrett in 1927. (His office was next door.) In 1930 Amherst Bowling & Billiard Academy and Lung Sang shared the ground floor, with Albert Bias elsewhere in the building. A wooden addition had been added to the back by this date. By 1936 Grandonico's Restaurant occupied the east side, with National Shoe Repair & Professional Cleansers on the west. The Grandonicos lived upstairs. In 1948, the C.&C. Package store occupied the west side, the Cramer family having bought the building in 1946. Grandonico's Central Restaurant became Keito's by 1960, and by the mid-70's the package store had expanded. Upstairs had become apartments. George F. Cramer, Jr. bought the family store in 1970. C.& C. was in business until 1990, but the building was sold to Ting-Wei & Shirley Shu-Mei Tang in 1993. Since 1997 it has been owned by the Shirley Shu-Mei Tang Revocable Trust, and a number of restaurants have occupied the ground floor: Amber Waves 1996-2003; the Fresh Side 1999-2006, Nick's Breakfast Place in 2004 and Lone Wolf from 2006. Mango Mango is expected to open in 2009.